Will My Real Old Self Please Stand Up? 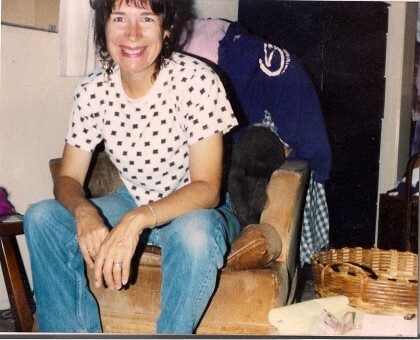 This photo was taken the summer I was 36, just before we moved to Idaho. I needed a shot of myself as a California Poets in the Schools instructor because some of the poems my students had written were going to be in a state anthology. There wasn’t anyone else around to do it, so I believe Michael took this picture. He was five. Already he had an exceptionally good eye. For a long time this picture was the only one of myself I liked. Absolutely the only one. I kept it on my altar as a reminder that I could look like what I thought was relatively thin and healthy. But about 10 years after, a strange thing happened. One day, in my mid-forties, I happened to walk by the dresser these things are on and I stopped to look at myself, along with a picture of my son at age 4 with a dear departed cat of mine. In that moment, I saw something completely different than the “perfect” old self I had wished to be. And these stunning words came out of my mouth as I pondered my own image: “Boy, she was so wound UP. What was she so wound up about?” And all the tumultuous striving and churning of hormones and terror of failure of my mid-thirties came back to me. So there I stood, a decidedly more chunky mid-forties woman with a degenerative disease of the central nervous system, feeling sorry for my as yet undiagnosed self about to jump out of her own more youthful skin. Perhaps I was helped to this way of looking at myself by excellent talk therapy I had during my 30’s. The woman I saw would later tell me that by the second appointment she had decided that any conventional approach would just not work for someone as creative as I was, so she’d go by the seat of her pants and see what happened. One of the things that happened is that she was able to get me to see that I could treat my inner 23 year old self, the one who had made such devastating relationship choices, the way I would the young women of nearly the same age who came to see me in my office hours as a writing counselor. I had never thought about it like that before, but once I did, it made perfect sense. In this way, I became accustomed to reaching my old selves with wisdom from my present self, no matter the seeming difficulties or changes in my abilities or appearance the present was handing me. I began to see that altough there was no going back, they were all walking with me simultaneously, just in different forms than the static images I used to hold, however perfect or imperfect I believed them to be. The astrologer in me would add that I was born when the moon was in its balsamic phase. This is the very very last sliver of moon before it joins the sun and becomes “new” again. We don’t often see the thin balsamic crescent, because it is only visible in the sky as dawn breaks. Its arc is quickly eaten by the sunlight coming over the horizon and bleeding out the residue of night. But if you ARE up very early when the moon is in this phase it is beautiful to behold, and to watch it fade as the day begins. In the symbolism of lunar cycles, the balsamic represents an inevitable crumbling of the present into the sensed but not yet fully manifested future. I find this theme ubitiquous in my life, if I am “up early” enough to pay attention. I certainly have a tendency to settle into situations that seem stable, only to discover they are coming unraveled at the seams. When I was younger, I thought this was somehow my fault, and that I needed to be more careful about situations and people I chose to throw my heart and energy in with. But then I realized there was more than unraveling going on. I was somehow helping with the transition, not by stopping the unraveling, but by being able to tune in to the new potential the unraveling would now make possible. And to have faith in what was as yet unformed or unseen. Or at least to accept. I actually somehow embody these transitions into the new in some organic way. I can sense them, and thus follow my instincts toward them. Most of us working with healing serious chronic illness often talk wistfully about having our old selves back, or being overjoyed when it seems like that’s exactly what’s happening. While I can relate to this somewhat, for me, it’s much more complicated. I know I am always living on the fault line where the old crumbles and buckles under into invisibility, while the new slowly pushes itself up into view from that same place of invisibility. I seem to know in my bones what John Travolta’s character in this scene from the film Phenomenon tells the children of his girlfriend when they are talking about knowing he’s going to die. They lean on a fence as he eats an apple and says to the boy, who is a particularly hard sell, “Everything is on its way to somewhere. Everything.” And so it is. The boy thinks about this carefully, then takes the apple from him, and takes the absolutely biggest bite his mouth can open to. So I guess that’s what I concentrate on. Opening myself to the greatest taste of healing I can experience. Surprisingly, that often means I find myself standing on ground that feels completely new; it’s sort of like how my old self used to feel it, only different. And better. Because I am no longer my old self. After all, we literally live in a physical body that incorporates such mystery. Every seven years our cells completely renew themselves, yet we remain in continuity with who we were in the old ones. And yet. . . I am still that old self, deep down, beyond the things I used to be able to do, or not be able to do. So I try not to wish too hard for getting my old self back. Sure, I “hang around” in familiar “places,” hoping to be able to make my hands do the things I’d like to do, like work in the garden or paint another watercolor. And when those motions become more natural I am overjoyed. But the me who has experienced them is not the same as she once was. She’s been through experiences that have changed her, shaped her, and, I hope, made her more wise about what it means to live in her own skin. The me I now am as I write this is struck by knowing the reason I look so great in the picture at the top of this post has less to do with being young and thin than it does with the fact that in it I am looking with love on my son as he took his first portrait. Perhaps I am not as attached to getting my old self back because as far as physical prowess goes, it was never that great to begin with. I love it when people who’ve known me for 20 years or less tell me I look younger every time they see me, or that I have a lilt in my step. That’s actually better than having them focus on the slight limp that is also recognizable if someone watches closely enough. It’s been with me all my life. The mild cerebral palsy I was born with has always ensured that any physical accomplishment I learned require an arduous, painstaking process that involves deliberate cognitive compensation until the fine or smooth motor muscles can somehow “catch up” and perform. It took me longer than most to be able to walk. It took me 3 years to learn how to balance on a two wheel bicycle. I still remember the first time my body “got” it. It also took me 3 summers of failed swimming lessons to learn to move my arms and kick my legs at the same time to actually swim. So I’m used to hard work for things that come naturally to most people—“just like riding a bike” isn’t “just like riding a bike” for me, as the saying goes. The naturalness of hard work makes me a tough customer when it comes to sympathizing with giving up easily. There’s nothing wrong with true letting go or surrender—a good measure of that often helps seeming miracles happen—it’s the giving up in a huff the instant something becomes challenging that gets me. When my own son was ready to balance on a two wheeler, he tried once and couldn’t stay up. He threw the bike down in disgust because he hadn’t balanced instantly and was about to storm up the stairs in a huff. “On no you don’t,” I said. “You’ve only tried one time. Let’s get you back on and try again. It took me 3 years to learn how to do this. It won’t take you that long, but you are not going to give up after only just one try.” The second time, the second time, that kid sailed down the pavement. I can still see him going, and feel my heart swelling, as I enjoyed the triumphant smile on his face. Maybe it’s because change moves so slowly in my life—and then all of a sudden abruptly–that I’ve become used to living in transitional phases where one thing is dying away and its new version is slowly opening first leaves. I do feel the impact; but maybe it’s a kind of “normal” for me that is simply the pattern of my life. One of my long time friends used to call me “Woman in a State of Constant Transformation.” The slow, miraculous improvements I’ve seen over the last 5 years of eating this way are unprecedented in the way they have helped me settle into and feel comfortable in my body. At times it feels so “new” that I am almost weightless, or insubstantial. And yet it’s very very real. So I’m always on my way to somewhere—whether I am arriving at a more compassionate or clear understanding of my old self, or following a faint outline coalescing of who I could be in the future— all are true, and they’re all real, and all are me. I don’t have to wish for the real one to stand up. They all need each other so I can be a me that’s more than the sum of my parts. I was so glad to get online this morning as I have my tea and see that this is already up!!! I am often thinking about the old me vs the current me. It is interesting. In a conversation with my Mom yesterday I realized that I did not want to be the old me at all! I guess I was already thinking of the “old self” notion, but it came into a clear perspective. I remembered when I was a kid, I could not WAIT to be an old woman, because I would (I assumed, lol) be SO wise, and hopefully kind, like my Nana was. And in that conversation yesterday I started to get a sense that I was still excited about that, and that I was starting to become that old lady that I had dreamed of being as a child, and that my illness was huge part of that transformation. And then there is the fact that there is my “old” self of the newly sick. Physically, there is no doubt that I am not all back to where I was prior to illness, but compared to my mental state? Night and Day. I am soooo much better. More patient. More disciplined. Stronger. Less of an escapist. More grateful. More confident, much more confident. Different priorities, and the ones I have now are far more valuable. Would not trade for the world. There are so many things that I have let go of from my old self that I am glad to be rid of! And these are really big shifts in perspective. This is a conversation that could go on forever! I think I am going to have to read and re-read this post multiple times. Thank you again Maria, for all you do for all of us. I am enriched by your words, and I am sure I am not alone. Beautifully said Maria. Thanks for sharing. You’re welcome, Karen. I appreciate your lovely comment. Although I’m not a wordsmith like you, I absolutely love all of your posts. You have so much insight. Beautiful post, Maria. You have such great insight to share with us! One of the gifts that MS has given me is the ability to slow down! I was also very wound up and a type A personality in my twenties and thirties. There are many things in life I enjoy much more now by slowing down. I suppose that comes with age as well. I love the picture – I thought, “wow! She looks so happy!” And then I read it was your son’s first venture into portraiture, and I understood why. Such a beautiful memory! Veronica, thanks so much for this beautiful personal reflection on my post. I really appreciate it and am so glad to know this is one you will come back to. And yes, the photograph contains a wonderful memory, considering now how Mike makes his living working with images.